Details on the 2019 National Community Association Law Seminar! As past President of the College of Community Association Lawyers (CCAL), I try to provide details each year on the national Community Association Law Seminar. Without question, the Law Seminar is the premiere HOA and condo legal program held each year. 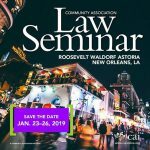 This year’s Law Seminar is the 40th annual and will be held January 23-26, 2019, at the Roosevelt Hotel in New Orleans, LA. While the Law Seminar is mostly attended by attorneys, it’s not limited to attorneys. Other participants include insurance professionals, community association managers, other industry leaders who wish to learn about HOA/condo law trends and practices. For insurance professionals who advise homeowner and condominium associations, the Insurance Masters Program (sponsored by the Community Insurance and Risk Management Specialists (“CIRMS”)) is for experienced insurance professionals and goes beyond the basics of community association insurance to include risk management and legal issues. An optional half-day program will be held Wednesday, January 23, with two educational sessions: an “Essentials of Community Association Law” associates track and a “Running a Community Association Law Practice” managing partner track. These optional sessions have an additional fee. Religion in Community Associations: Fair Housing of Free Speech? More information and the full schedule can be found at the 2019 Community Association Law Seminar Web site. This entry was posted in HOA & Condo Associations and tagged community association law seminar, community associations institute by Jim Slaughter. Bookmark the permalink.